Windows 10 Anniversary Update: The most famous computer operating system celebrating its first anniversary of its latest version, Windows 10. The company already gave the notification as the Widows 10 Free upgrade were ending on July 29, 2016. And the New Anniversary updates are available from August 2, 2016. So, here the company confirmed it and the users can now update your Windows 10 by following the steps here below. Also, here you can read the Highlighted features of the Windows 10 anniversary updates. Watch the Windows 10 Anniversary Highlights Video here. The Company released the Video on YouTube with the title of “This Week on Windows: Anniversary Update.” It has 6:52 minutes run time. You can feel the new features along with the new experience of Windows Ink, Cortana, gaming features and more. The Official Windows blog just highlights the important features on sub-headings. Here we listed all those titles. Just read it, guys. Windows Ink brings the power of Windows to the tip of your pen. Improvements to security with Windows Defender and Windows Hello for apps and websites. Increased power efficiency with Microsoft Edge and the arrival of extensions. Cortana helps you be more productive. Gamers stay connected and enjoy more games. Windows Store is a one-stop shop for play and work. New innovations for the modern classroom. Try the new Skype Preview with the Windows 10 Anniversary Update. Also, Scroll down and Watch the Windows 10 Anniversary Update Video. The Officials confirmed it that the Windows 10 Mobile Update will release in coming weeks. 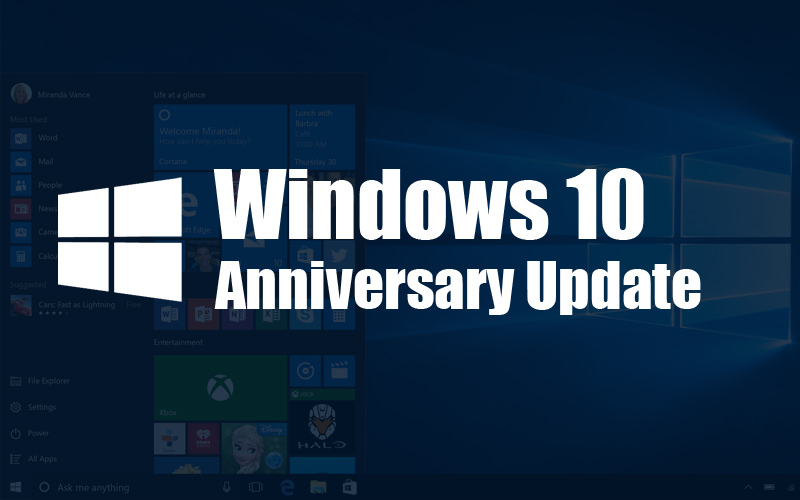 Your Windows 10 PC will get anniversary updates automatically if you have the setting on your PC as Updates Installs Automatically. Or otherwise, you can do it manually by following the steps that we provided here below. Kindly Visit the “Settings” option and select “Updates & Security,” then Windows updates. Click Update and your Windows 10 Anniversary update will start downloading and auto-installing. One More way is there to get the Anniversary Update. Just click the ‘Learn More‘ after the line “Looking for info on the latest updates?” in the same screen. This navigation link will be taken you to Microsoft Support Page. Now click the button “Get the Anniversary Update.” It allows you to download the Windows 10 Anniversary Update on ISO file. Stay tuned with WORLDHAB.com for More Technology Updates!